Four-color, temporary tattoo or special-effects airbrush paint set. Water-resistant and non-toxic colors are ready-to-use right out of the bottle; safe for use on the skin (not for use near eyes or face). Formulated with an alcohol base and high-grade pigments for unrivalled coverage and superior sprayability. 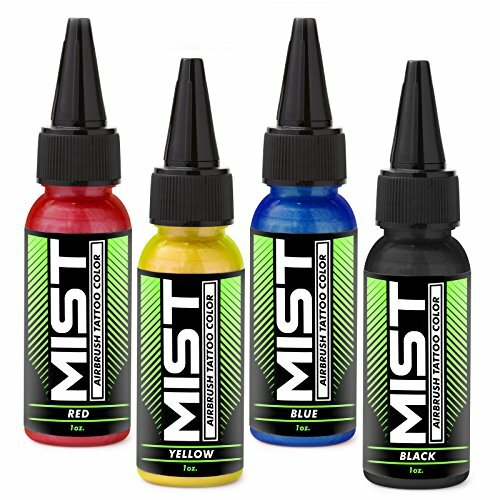 Included colors are Yellow, Red, Blue, Black (paints may also be mixed together to create custom colors). Depending on the skin’s moisture and oil content, this paint can last up to 10 days (remove anytime with baby oil or isopropyl alcohol). Each bottle contains 1 ounce (30ml) of paint.